Apple announced its new iOS 7 AirDrop feature that will be releasing on the iPhone 5, 4th Gen iPad, iPad Mini, and the 5th generation iPod touch, some emails have already come in to Phones Review saying surely this is a iOS 7 AirDrop vs Samsung S Beam game. The emails did not state they were iOS or Android users etc, so we cannot judge on any of this. But, we can say AirDrop is a great feature and no bumping of phones is needed unlike S Beam. We are not hear to slander AirDrop or S Beam, we want to provide you with the latest news about the new AirDrop feature that will be released in the fall with iOS 7, developers will get it today in the new beta test. The iOS 7 AirDrop feature will work in the same way AirDrop on Mac works thanks to the same P2P abilities, AirDrop works without any network or set up requirements. If you want to send a file to someone or multiple people all you need to do is select that person/s and click the share button, all transfers are encrypted and works on either Bluetooth or WiFi. AirDrop can be accessed via the new Control Center, which works when you swipe from the bottom of the screen upwards, which is the opposite way you would open notifications by sliding from the top of the screen downwards, we will talk a little more in another article about the Control Center. Samsung S beam found on many Android devices works by touching phones, similar to the iOS Bump app but more efficient, we have used S Beam on many devices such as the Galaxy S4 and cannot fault it. But, we have to say AirDrop seems to be a little more refined and more practical, we will let you decide this one. Matthew Miller via ZDNet talks a little about Samsung adding new features that are great in ads/commercials etc, but rarely get used after the initial trials, what he has to say is worth reading, maybe you would agree or disagree. AirDrop vs S Beam: What one is more practical? Airdrop is the exact same things as WifiDirect peer-to-peer sharing which android has had… so why not compare to that? There is not a SINGLE new or innovation feature on iOS7 that android has not had. most of the stuff you are referring to android “already having” was stolen from the original iphone. So you can say Apple copied Android, who copied Apple. I’m not sure if its illegal to copy your own ideas. Im obviously not referring to the never before seen stuff such as iTunes Radio, but the basic stuff such as Homescreens, App Layout, App Store, etc. 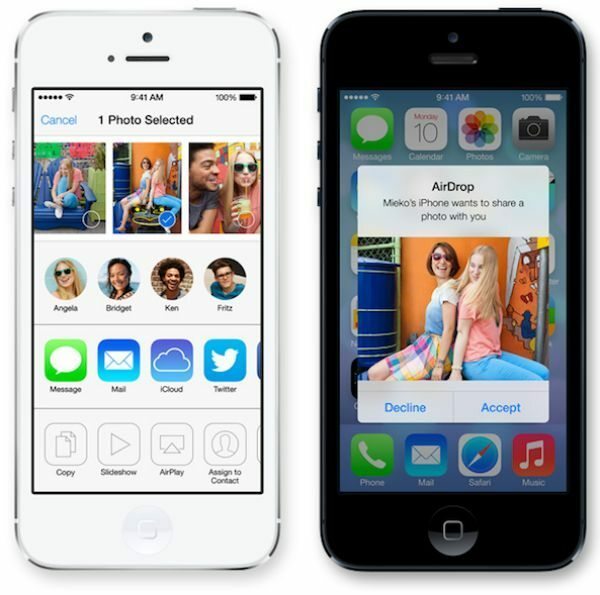 apple already had airdrop before android had the sharing. It was a feature of the mac computers before coming out for android. They just didn’t have it on the iphone. They actually came out the same year(android a few months later) so there wasn’t any copying going on at all just different uses of the same technology at different times. OK….now how about comparing it to Group Play on Samsung. Until when apple fan will realize that Apple is joking with them? apple still thinks that bumping app is the latest technology, will lat us see bluetooth , FNC (sorry apple but it’s fast and very easy to use), what’s app and direct wifi. oh yes, multitasking is old fashioned, multi windows is the new fashion. The question is what will apple allow you to transfer? How big can the files be? I can transfer a movie the largest movie I’ve transfered through SBeam is 3gb, is that possible with airdrop? Or will you still have to go through iTunes? Just asking an honest question. This is not an ignorant comment like Rob McMeechan. I just share via airdrop the man of steel movie and 3 photos at the same time 3 photos with my girlfiend. I hope that answer your question. at the end of the day, it is still on preference. whether ios or android it’s up to your taste. i use both but android is more preferable. Ya go iphone go android both are better than each other lets fight ya!! !